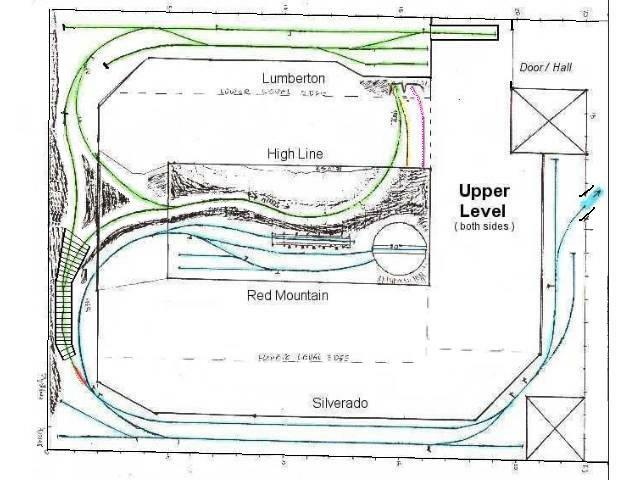 The following is the final track plan, as drawn, for the layout currently under construction. main layout. Most of this plan was hand-drawn by my good friend, Paul Steves. and ending with a temporary fiddle yard of 3 tracks, at Los Pinos. The Silverado and Red Mountain branch are in blue, and the High Line and Lumberton branch are in green. The 3.25% grade running thru Vista Grande, connecting the Los Pinos yard (on left), up to Silverado. 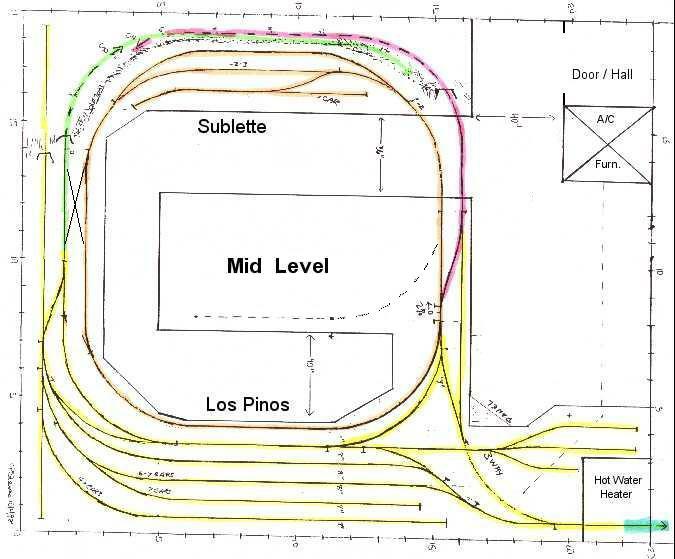 The Los Pinos yard (in yellow) and the start of the branch to Lumberton (in green starting on left side). Plus the “loop” running thru Sublette (in orange). 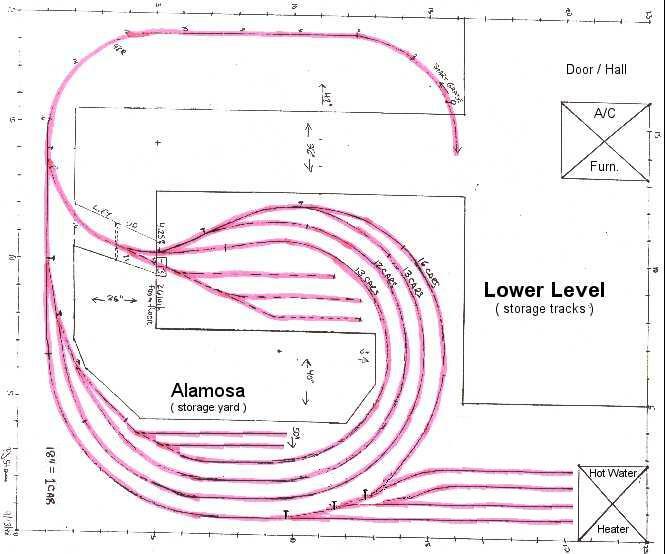 Plus the connection running to the Alamosa storage area below (in pink). Alamosa, the sub-level or hidden storage tracks. Running loops for parking trains, plus spurs for extra engines and trains. You take a local freight up the mining branch… Your train departs the Los Pinos yard, (going to the right) thru the ‘Hot Water Heater’ tunnel. It begins the long 3.25% grade, thru Vista Grande (in the bedroom). Along the way, you may have to switch at the two spurs in Vista Grande. 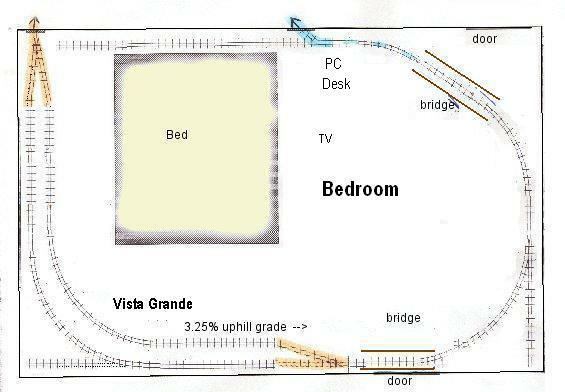 You continue up the hill, past the ‘interchange’ track (which is a storage spur over the bed’s head board), and thru the tunnel. You enter the Silverado mining camp. You have switching here. Plus, you break the train down and take 1 or 2 cars to the end of the line, to the Red Mountain mine. You turn on the turntable, come back to Silverado and rebuild your train. After a an air-test, you bring your train down the mountain, back to Los Pinos yard. Your train is built in Los Pinos. Your train departs the yard (going left) and takes the crossover to Sublette. You may have some switching here. You continue and pass by the yard (on the by-pass main), and cross-back over to the mining branch (orange over to green). In the tunnel you feel the 4.5% grade begin, as you climb towards and cross the fabled High Line. Soon after you pass the Wye and enter the community of Lumberton. You have switching here, from local industries and the empty log cars. You pick up loaded log cars, some other freight and turn your engine on the Wye. Rebuild your train and head back down the mountain to Los Pinos. Your train is big, with a pair of six-axle road diesels and 10 to 15 cars. You leave the striving city of Alamosa (ok, the lower storage area) and head off in to the mountain regions. As your train departs, you climb the 4.5% grade (under the layout) and come out of the tunnel on to the short flat land. You cross over a branch line track and take the by-pass main, going in front of some other yard area (hum?). You cross-back over (the orange to green) and enter a tunnel to start a 4.5% grade up over the mountains. Your train emerges out on to a breath taking mountain side as it clings to the cliffs. You take a switch left at a Wye at the summit. This leads you in to a snow shed, and you come out in another small community that you fly thru and wave. Your train proceeds thru a short tunnel and begins the long 3.25% decent downhill run thru a “sleepy” community and valley. You pop thru a short tunnel and come out at the Los Pinos yard. You set out a cut of cars, could be 5 to 10 cars of your train, and pick-up a handful. Your train departs on to the next community and proceeds thru the yard. It circles a small valley (the orange line), and takes the wye switch left, passing some other yard? In to a tunnel and starting up a grade, on to the next town. The Main Line train crosses the entire layout in a main line flow, only stopping at Los Pinos and passing thru most other areas. It leaves the storage, travels over the mountains and back to the yard. It then doubles back over the same track to return to storage. You will notice a switch at one end of Silverado, in orange, connecting to the tail of the Lumberton Wye (in blue). The only time this switch is used is for the main line runs (and open house).